Ian McCulloch & Carolyn Seymour Survivors Doctor Who Zombie etc. She also appeared in Quantum Leap with fellow Trek actors Scott Bakula and Dean Stockwell, as well as the 1981 comedy Zorro, the Gay Blade as the wife of Clive Revill. 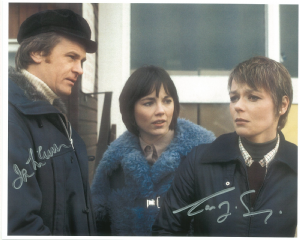 Prior to her Trek and Quantum Leap appearances, she was best known for her work in the British-made post-apocalyptic series, Survivors with Ian McCulloch. She currently does voice work for Star Wars video games (including Star Wars: Knights of the Old Republic with Raphael Sbarge), as well as voicing Doctor Chakwas in the Mass Effect series (which also featured Marina Sirtis, Michael Dorn, Armin Shimerman, and Dwight Schultz) and various characters from Dragon Age: Origins (which also featured Kate Mulgrew, Tim Russ, and Paul Eiding). Carolyn also provided the voice of Queen Myrrah in the first three Gears of War games. best known for his role as Greg Preston in Survivors. Though he debuted in the second episode, "Genesis", Greg would become the male lead for the first series, and got to show off his singing and guitar playing in several episodes. However, he was unhappy with the introduction of Denis Lill as Charles Vaughan, a male co-lead, during the second series. McCulloch wrote the seventh episode of the second series, "A Friend in Need", and was ostensibly written out at the end of that series. He would only appear twice in the third and final series, in the second episode "A Little Learning" and the tenth, "The Last Laugh". He wrote the scripts for both episodes..